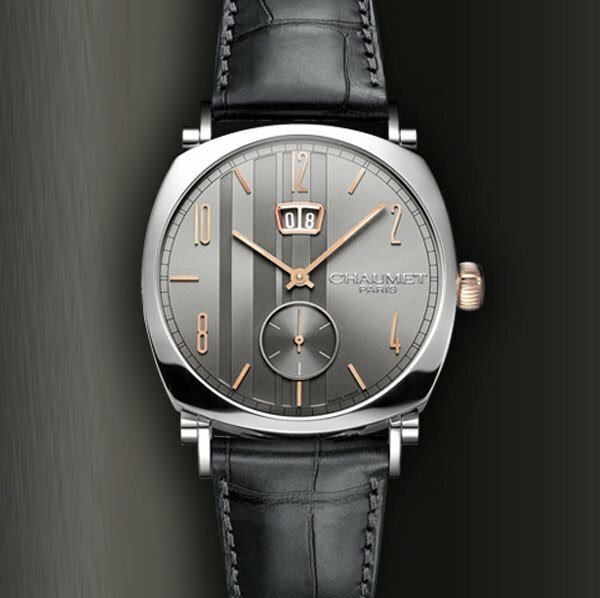 Chaumet launches a new Dandy Big Date that comes in a timeless "vintage" style: a great classic revisited to display time & date with the utmost elegance. Easily recognizable thanks to its bold design - its cushion-shaped case and bayadère stripes, the Dandy watch dresses in the elegance of the 1950s. • Dial: base in charcoal grey opalin, sunray fine-brushed, with vertical bayadères stripes engraved; azuré small second counter at 6 o’clock; double big date window at 12o’clock. • Bracelet in charcoal grey alligator leather strap, double-folding buckle in stainless steel. • Cushion-shaped, fluted crown in pink gold - like the case.